Canadians love salt. A recent study revealed that some fast food items sold in Canada were substantially saltier than the same items sold in other countries (Weeks, 2012). And since making the comparison is essential to our identity as Canadians, yes, we’re saltier than Americans. But our love affair for salt doesn’t end with fast food. We also love our salty winters. As soon as we get a dusting of the winter white stuff or the temperature drops below freezing, our salt trucks rumble out of hiding, covering our roads and everything else in our favourite seasoning. But in the same way that our personal salt intake can damage our bodies, leading to high blood pressure, heart disease, stroke, kidney disease and other problems, our excessive environmental use of salt can damage plants, animals and water (Environment Canada, 2007). Not to mention, salt can ruin a great pair of leather boots and leave unfashionable stains on pant legs. And while this example of fashion may seem trite, in a zero waste framework, it’s important to recognize that even the smallest items we own embody broad environmental and social impacts so it’s important to take care and use everything as long as possible. On a bigger scale, beyond leather boots and crusty pant legs, salt also eats away at our cars, buses and bicycles (for those that brave the winter streets) and damages our infrastructure. On this last note, salt is one of the major reasons why Toronto’s main artery, the Gardiner Expressway has been crumbling, cracking and spontaneously shedding giant chunks of concrete (up to 200 pounds!) for the past 35 years. More than 1,000 tonnes of salt are dumped onto the elevated stretch of the expressway every winter. That salt eventually seeps into the structure, corroding and expanding the steel beams inside, causing the concrete that envelops them to crack (Topping, 2012). Unfortunately, Canada’s freeze-and-thaw climate – where Torontonians may bask in balmy 12 degree weather only to be whipped with a bone chilling -23 degrees the following week – requires even more road salt than other cities where the cold weather is more continuous. Since moisture on the road warms up during the day and then freezes at night, we need lots of salt to prevent ice formation. Bridges (or elevated expressways) need even more to prevent freezing (Lakey, 2012). 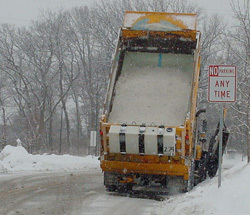 This all amounts to an estimated 4.9 million tonnes of road salt being released to the Canadian environment every year (Health Canada, 2007). But what are the alternatives? Sand is able to provide traction and by absorbing sunlight, can help with melting. It’s also inexpensive and relatively harmless to the environment. Secondly, there’s always muscle or machine power to push a snowy mess out of the way. And while these are generally the two alternative options that North Americans look to, some other places like Oslo, Norway, have installed electric heated-coil sidewalks and roads (CBC, Life Below Zero, 2012). While this may seem like an extreme measure, studies have shown it’s actually cost effective over time and can save on healthcare and ‘time-off-work’ expenses related to ice injuries. Not to mention, melting via heat doesn’t require any environmentally or fashionably detrimental chemicals! The other option, which the documentary Life Below Zero examines, is that instead of trying to make winter go away, Canadians should embrace the snow and learn to live in our natural habitat. 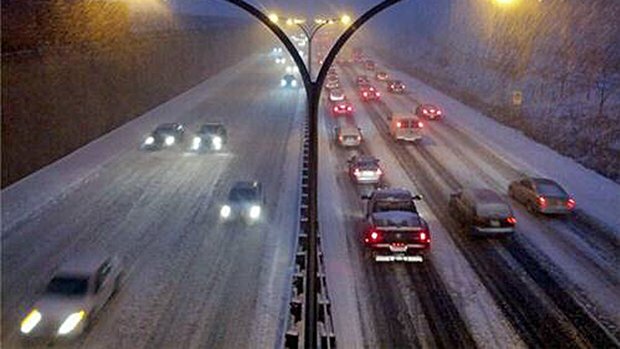 So who’s up for skiing the Gardiner next snowfall? Tags: Canada, CBC, fast food, Gardiner, heated sidewalks, Life Below Zero, Norway, Oslo, road salt, rust, salt, salt consumption, sand, skiing, snow plow, Toronto, winter, zero waste. Bookmark the permalink. As a civil engineer in Maine, I can safely say that salt is our worst enemy. We have extremely salty winters, and all of our roads are in crappy shape. Although a lot of that has to do with frost heaves and lack of money, salt definitely exacerbates the problem. I doubt that anybody could get the set-in-their-ways old timers to look into alternatives, though. Ah yes, didn’t mention how it ruins the roads as well. Definitely not a good solution for our cold climates! Check out that documentary if you can Lauren – not sure if it’s available to watch in the US – but it’s a really interesting perspective on how other countries embrace winter compared to us wimpy North Americans! soon but I’m having a hard time making a decision between BlogEngine/Wordpress/B2evolution and Drupal. The reason I ask is because your design seems different then most blogs and I’m looking for something unique.